There are very few incidents that a car built for the US gets space in this market. It is not about the imports. Instead, it is about those cars that already served the other market and later entered into the North American space. Well, Ford tried this trick. In 2003, the EcoSport was introduced in the Latin American market to serve as a subcompact SUV. After a successful tenure, the car entered the Asian and European markets. And just recently it has been introduced for the North American market. Though already the EcoSport was marketed in Mexico. But it is the very first time it joined the US and Canadian markets. The Ford EcoSport is going through its second generation. The first one ended up in 2012 soon after the new version was displayed at a motor show in India. Well, the first generation was quite similar to the European version of Ford Fusion. And it had some similarities with the Mazda Mazda2. By the summer of 2012, the second generation came out into the market. Ford decided to bring EcoSport to the Asian and the European markets after a successful turnout of the first generation. Well, the plan was never bad, instead, it gained more revenue for the country. Even Ford started building this car in Asia and Europe as well. During 2016, a facelift version was displayed at the LA Auto Show. That was the first time Ford brought this car to the US market. And with some necessary improvements, the EcoSport was launched here. Well, the EcoSport begins from $19,995 with four models in the range. The EcoSport S is the entry-level model. The SE and SES sit in the middle while the Titanium is the top trim level. The Ford EcoSport has a drivetrain for every region. It addresses every segment equally with their performance consideration. Like here in North America, the EcoSport is available with two powering options. 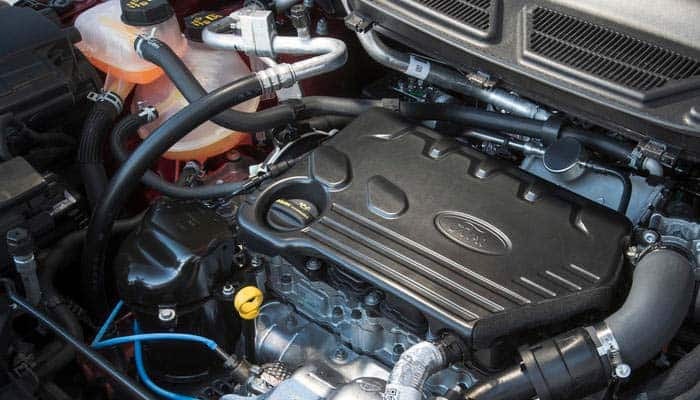 The 1.0 L 3-cylinder EcoBoost engine comes standard with 123 hp of power at 150 lb-ft of torque. While the 2.0 L 4-cylinder TI-VCT engine is optionally available having 140 hp of power at 137 lb-ft of torque. And this powertrain is configured to all-wheel-drive. Further, both of these powertrains come mated with the 6-speed automatic transmission. When you move into Europe you get the EcoSport available in gasoline and diesel variants. The gas version gets the same 1.3 L engine available in North America. While the diesel variant gets 1.5 L 4-cylinder engine making 90 hp of power at 150 lb-ft of torque. The Asian model is available with the 1.0 L 3-cylinder engine with 99 hp of power and 130 lb-ft of torque. This is the standard powertrain available on all the models in Asia. While the North American 1.3 L powertrain is marketed as the mid-trim level. And the top-notch gets the 1.5 L 4-cylinder engine with 108 horses pounding 103 lb-ft of torque. The Russian version gets the powerful mechanism. The 1.6 L 4-cylinder is the base equipment with 122 hp of power and 109 lb-ft of torque. Further, the 6-speed manual is standard with a 6-speed automatic as an option. The Brazilian version is the base variant of the Ford EcoSport. It gets the 1.6 L 4-cylinder engine with an acceptable performance level. Further, it offers 113 hp of power at 115 lb-ft of torque and it comes mated with the 6-speed manual transmission. Additional the 4-speed automatic transmission is available as an option. A monstrous styling settles down in the EcoSport’s exterior. A giant grille, patched up with projector headlamps and grooved fog lights is the fate of this car. While the rear design is similar to the MPVs with a spoiler. Further, the base models come with the 16-inch alloy wheels and limited color options. While the top models are available in various colors and come with 17-inch wheels. The base EcoSport combines ordinary ingredients for the interior appointment. While the upper trim levels get the refined material. 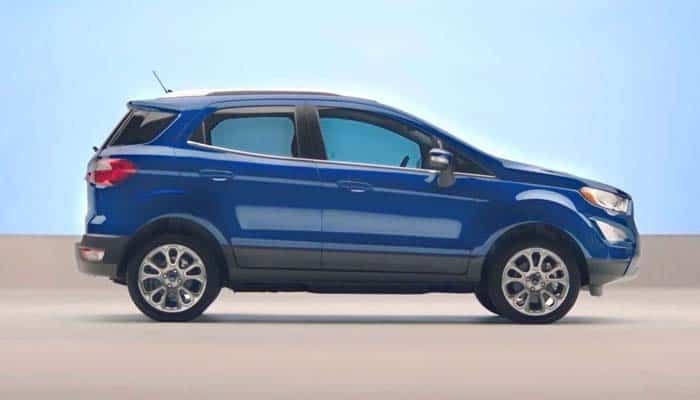 Ahead of that, the EcoSport offers plenty of seating space with a high roof. And for the cargo, you get enough boot to carry the groceries. Well, the cloth seats with the fiber accent are available on the base models. 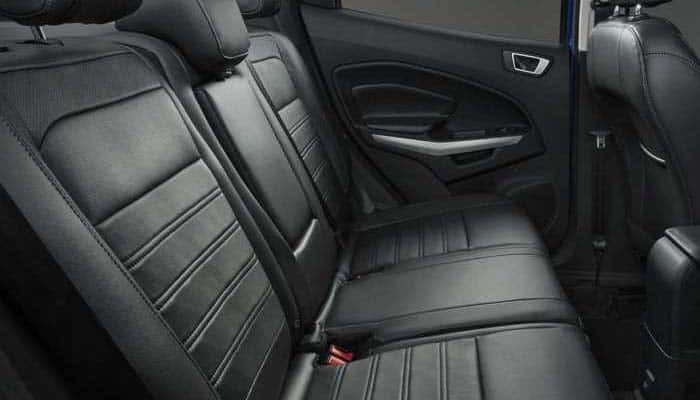 While the upper trim level gets the leather bucket seats. 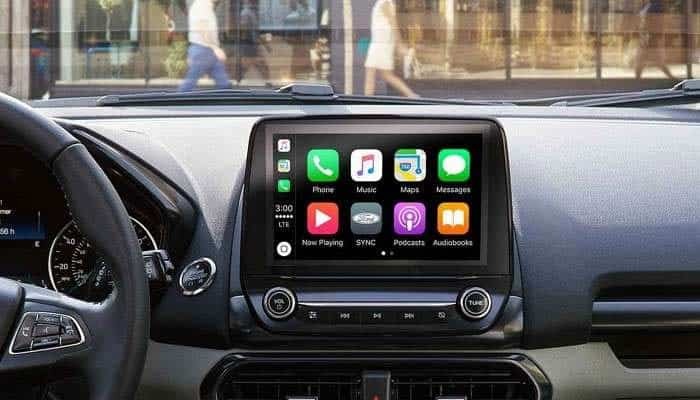 The Ford EcoSport comes with a 4.2-inch touchscreen infotainment system with the Apple CarPlay and the Android Auto. Further, the 8-inch screen is available for the top trim levels. Well, these systems include the Bluetooth streaming, remote control access, navigation and multimedia options. Ahead of that, the EcoSport features the remote anti-theft system. 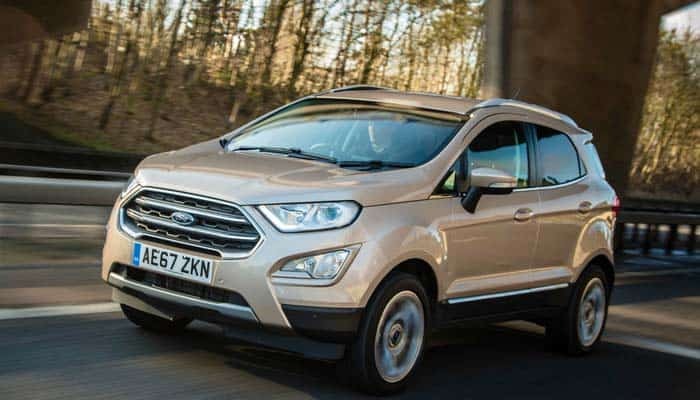 The Ford has covered a wide area of safety for the EcoSport. The essential passive safety equipment such as the airbags and the seatbelts are standard. Further, both the rows get airbags. And head restraints, LATCHES, and adjustable seatbelts are also included. Ahead of that, the active safety column is filled with emergency brake assistant and antilock braking system. While the driving dynamic features include the tire pressure monitoring system, seat belt reminder, rearview camera, and the collision alert system. The wider market conception gets a greater choice of competition. At some end, it is Kia competing with the EcoSport. While at the other end Mazda comes up to give a hard competition. 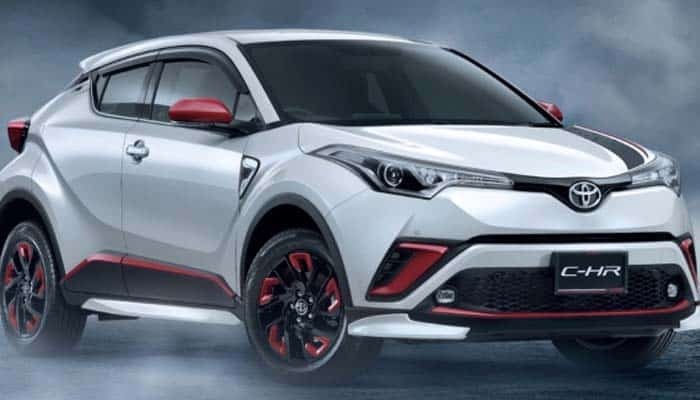 While here in the US, the Toyota C-HR competes the Ford EcoSport. Well, both these SUVs offer a similar quality of driving experience. While the designing and interior setup is mainly different. 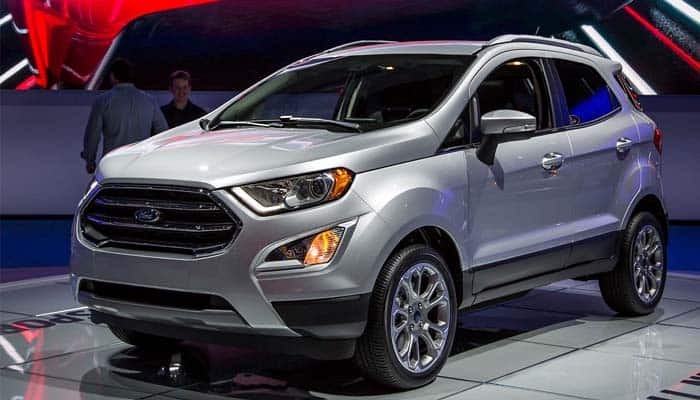 The Ford EcoSport is going through its initial years in this market. And there is too much for it to cover. Well, a strong powertrain and comfortable interior would certainly make it build a strong market rep.